The aroma of the crackling fire from a wood sauna heater is part of the great Finnish sauna bathing experience. If you have an area in your home or in an outside sauna cabin where you can install a wood burning sauna stove or are wondering if this style of heater is right for you, we have a few tips for installing one. A wood sauna heater is considered the same as a wood-burning fireplace and you’ll need to know the local building code as well as manufacturer specs required for proper clearance from combustibles in the sauna room. 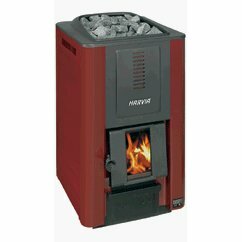 Your first task must be to check regulations regarding installation of a wood fired heater. For insurance reasons, wood burning stoves must be installed in detached sauna buildings and are usually not acceptable in the main residence. However, they are ideal for outdoor sauna cabins with no electricity. The floor or base the sauna stove sits on should be a minimum of 2” of concrete, or 1/4” thick fiber-reinforced concrete plate covered by a metal plate. In addition, the floor in front of the stove must be protected using acceptable material (such as a metal plate) that extends 12” beyond the width of the oven mouth and 18” in front of it. The wood sauna heater should not be closer than 12” from any wall. If it is closer, the wall must be covered with a flame-resistant shield. A wood burning stove must be connected either to a sound masonry chimney or a UL approved Stainless Steel Class "A" Insulated Chimney. Check the heater instructions regarding requirements for the stovepipe that connects the sauna stove to the chimney. They usually require it to be something like 7” in diameter and must be made of double-walled steel. A sauna room with a wood burning sauna stove needs an external air intake vent. Since wood heaters can be difficult to regulate and can get very hot, you’ll need a vent with an adjustable cover to allow more air to circulate into the room. As for an exhaust vent, the flue does that job. Most sauna stoves will accommodate logs up to about 16” in length. The wood should be cut at least a year in advance, be properly dried, and then stored out of the weather (that is, cover it with plastic if it’s to remain outdoors). Consider buying a wood burning sauna stove with a glass window to enhance your fire-gazing enjoyment, plus it will give the room the ascetic feel you seek. A sauna stove that burns wood offers soft löyly, soft heat, and the pleasurable experience of a crackling wood fire. Most sauna enthusiasts will tell you that any other type of sauna heater - electric, gas, or infrared - just won’t compare to the real thing. But a wood sauna heater installation can be a complicated process with its own special concerns for stovepipe and chimney connections, so it’s usually a good idea to hire a professional to do the work.